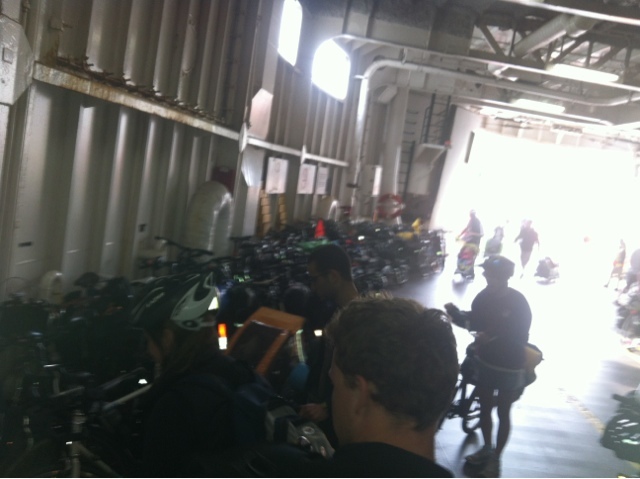 I'm pretty sure that bikes out numbered cars on the ferry back from Galliano island this weekend. BC Ferries needs to respond to this demand, especially on long weekends by offering better service and amenities to cyclists. A few things that would be a great help, would be an option to reserve a spot on the ferry and some type of rack to store bikes in. As you can see, with the high volume of cyclist, space on the deck is at a premium. Bikes have been stacked on top of one another. Not only is this inconvenient, it can also scratch the paint and damage components . For the extra money I pay to take my bike on the ferry vs. walking on a bit of service would go a long way.